May 31, 1943: The Adventures of Archie Andrews was a comic strip sitcom that came on radio, and was he aired on the NBC Blue network. The radio sitcom was based on Bob Montana's comic strip about Archie Andrews and his teen-age pals. They moved to Mutual Broadcasting in January 1944, and then to NBC in June 1945. Archie, Veronica and the gang stayed on radio for about ten years. 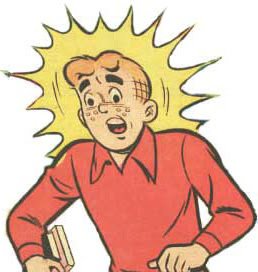 "The Adventure of Archie Andrews" was a 15-minute radio series aired daily on NBC Blue. For a brief period, it was aired in a different timeslot, every Saturday mornings for 30 minutes. When it transferred to Mutual in 1944, the it was broadcast again during weekdays. From its debut up to 1994, the series fared pretty well, although it was only in 1945 when it rated extremely high due to the introduction of new characters. The actors that portrayed Archie Andrews include Jack Grimes, Charles Mullen, and Bob Hastings.